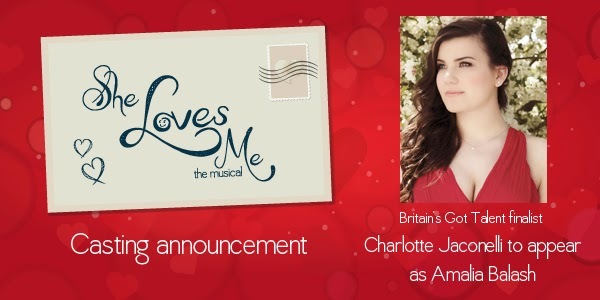 Casting has just been announced for the musical She Loves me which is due to run at the Landor Theatre from 4th February-7th March. Charlotte Jaconelli is playing the the female lead Amalia Balash. She reached the finals of Britain's Got Talent with singing partner Jonathan Antoine in 2012 and the pair subequently released 2 Gold certified albums after signing with Simon Cowell's record company Syco. Since going solo, Jaconelli has toured the country and released her debut solo album 'Solitaire'. Joining Charlotte in the cast is John Sandberg as George Nowack, Emily Lynne as Ilona, Matthew Wellman as Kodaly, Joshua Leclair as Arpad, David Herzog as Sipos and Ian Dring as Mr Maraczek, with George Mulryan, Luke Kelly, Tom Whalley, Rosie Ladkin, Olivia Holland-Rose, Annie Horn and Susie Chaytow.